The median price of a home across the Seattle metro area has now soared 80 percent since bottoming out five years ago, and it’s up 20 percent over the old pre-bubble peak a decade ago. Seattle is now a full year into its reign as the hottest housing market in the country, an unusually long surge that doesn’t look likely to end anytime soon. Single-family home prices across the metro area grew 13.2 percent in August compared to a year prior, easily the most in the nation and twice the U.S. average, according to the monthly Case-Shiller home-price index, released Tuesday. Las Vegas replaced Portland as second behind Seattle after the two Pacific Northwest cities had been the top two markets since last year. Seattle has had the biggest annual home-price gains of any region in the country for 12 straight months. That’s the fifth-longest streak in the country since 2000, and the longest since Phoenix led the nation in home-value increases for 13 months in a row from 2012 to 2013. Seattle has been a national standout like this only once before. From the summer of 2007 through mid-2008, as the U.S. housing market was heading toward collapse, Seattle also topped the country for a year straight, right before home costs plummeted. This time, the trends nationwide look different. 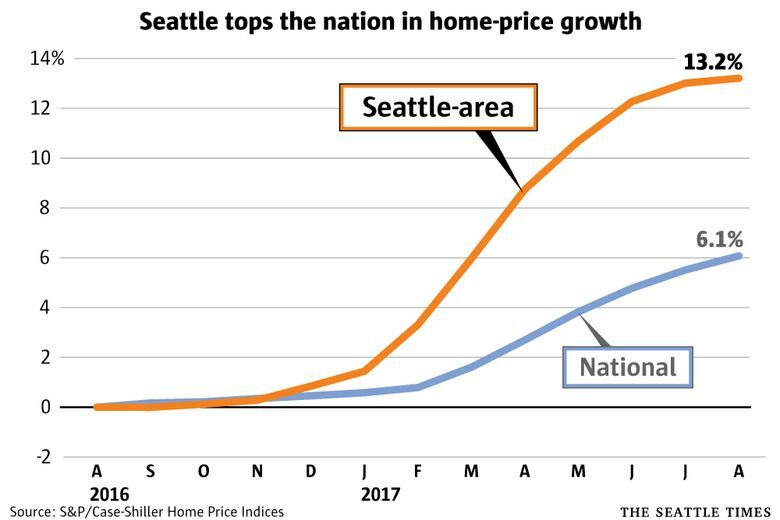 During the bubble a decade ago, home costs just about everywhere were soaring at eye-popping rates, similar to what Seattle is dealing with today. Now, Seattle is an outlier — everywhere else is experiencing growth that’s slightly or moderately above average for that region, while prices here are increasing nearly three times as fast as the historical average. Overall, home costs here are growing at more than double the national rate of 6.1 percent. That’s been the case for the last year. And home prices continue to outpace wage growth, which was 3.6 percent nationally in August. So when will Seattle’s run as the hottest market end? Probably not anytime soon, given the gap between Seattle and the rest of the country. The second-hottest market, now Las Vegas, saw prices grow 8.6 percent, nearly 5 percentage points less than Seattle. Still, there are signs of at least some slight cooling locally. Compared to just a month ago, prices here ticked up just 0.2 percent, among the lowest rates in the country and the slowest since last winter (although that’s typical for us this time of year — when adjusted for normal seasonal changes, our month-to-month price growth beats out the national rate). And the year-over-year price growth of 13.2 percent was down a bit from the peak surges seen earlier this summer, when costs soared as much as 13.5 percent, which had been the biggest jump since the bubble a decade ago. Plus, we are heading toward the slowest time of year for home shopping, when buyers are more likely to avoid bidding wars and prices usually drop a bit from their spring and summer highs. “There are early signs that price (growth) may have peaked” in Seattle, said Cheryl Young, a senior economist with Trulia. But the Case-Shiller data show the mini-slowdown is happening only for luxury homes and in expensive neighborhoods. Prices for cheaper homes, which are generally in outlying suburbs, are rising at their fastest rate in more than three years. The Puget Sound region continues to stand out for a few reasons: Tons of well-paid tech-job openings have drawn in scores of new residents while fewer and fewer people are selling their homes, leading to intense competition among buyers. Seattle also is among the most coveted markets for foreign investors. And rents here are soaring at close to the fastest rates in the country, with the average two-bedroom rent now topping $2,000, pushing more people into the homebuying market. Jeff Reynolds, a Windermere broker who blogs for urbancondospaces.com, noted this week that there are only five condos available in downtown Seattle for under $500,000, and that price now typically gets you a small one-bedroom. Reynolds found significantly more condos for under half a million dollars in the downtowns of peer cities — even San Francisco has more (although those other cities have larger condo markets than Seattle). Overall, prices here have soared 80 percent since bottoming out five years ago — only San Francisco and Las Vegas have had bigger price increases during that span, and prices nationally grew 46 percent over that time frame. And home values locally are up 20 percent over the old pre-bubble peak a decade ago, behind only Dallas and Denver. The median house now sells for $725,000 in Seattle and $855,000 on the Eastside. It’s $450,000 in Snohomish County, and near $315,000 in both Kitsap and Pierce counties.